Lite-a-Line is a combination of pinball and bingo. It's like pinball because of the way you use a plunger to shoot a ball on a board, but it's like bingo in that you want that ball to highlight five spots in a row so you can win. As the ball drops through 25 holes on the board, corresponding grids on a five-by-five scorecard are illuminated. Players usually wager $1, with the winner earning $15. 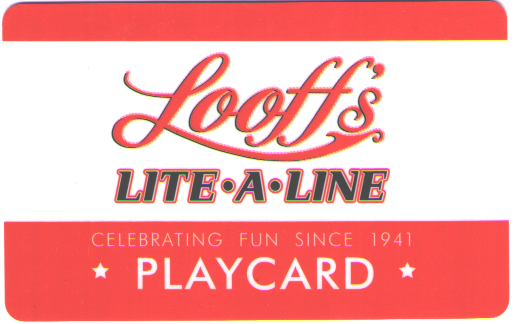 The only known location in the world to play this game is at Looff's Lite-a-Line in Long Beach, California. The following rules apply to common games, which account for about 90% of games played at Looff's. A caller will start the game. When I was there, the player could actually start about one second before the announcer called "start," as evidenced by a clicking noise the game made when the plunger was activated. As in pinball, the player pulls back a plunger and releases it to propel the ball up the inclined board. If the player doesn't release the ball with enough force, it won't reach a certain drop point on the board and will roll back down to the plunger, wasting time. If the player releases the ball with too much force, it will pass the drop point, bounce off a rubber peg, and return back to the plunger, wasting even more time. If the player releases the ball with an amount of force in what I'll call the "sweet spot," then it will drop down the board toward the 25 holes. The holes are grouped into five colors, with five holes per color, numbered one to five. About 90% of the time, the ball will pass through one of the holes. As the ball passes through a hole, it will illuminate the designated spot on the score board, unless it was already marked. The center red-3 square is pre-marked before the game begins. The first player to complete five in a row (horizontally, vertically or diagonally) on his card will sound a bell and cause all plungers on all the games in the room to lock up. Any ball still rolling down the board when the game locks up may continue until it reaches the bottom, possibly triggering another win if it passes through a hole completing five in a row. $15 shall be split among all winners. The vast majority of the time, there is one winner only per game. A $2 bonus is paid for a win with no extraneous marks on the card, which they call a "perfect game." In addition to the common games above, some games cost more but have a larger jackpot. Others split the prize: $3 to the first player to get four in a row, which doesn't lock up the game, and $12 to the first player to get five in a row. 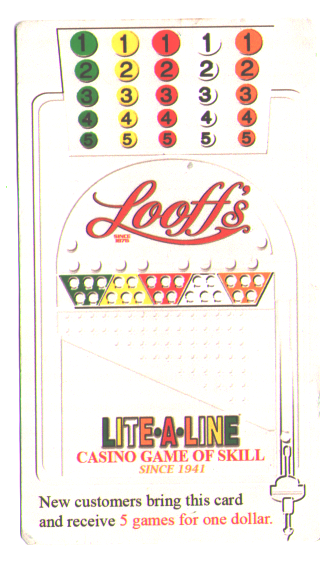 Lite-a-Line was created by Charles Looff. If the name sounds familiar, Looff was the creator of the first carousel. In his spare time as a furniture maker, he carved wooden horses and other animals, which he made into the world's first carousel and installed at the Coney Island amusement park. He parlayed that success into making more carousels, Ferris wheels, roller coasters and other amusement park rides. He went on to build and then sell amusement parks from California to New York. He eventually settled in Long Beach, California, where he built an amusement park known as The Pike. It started out strong, but due to competition from Disneyland and Knott's Berry Farm, The Pike fell on hard times and closed in 1979. The only remnant from The Pike that remains in business is the Lite-a-Line game, which has since moved further inland and is close to the intersection of Willow and Long Beach Boulevards. Today, the public can play Lite-a-Line at Looff's and step back in time as they look at memorabilia from the old Long Beach Pike. Admission is free, but you must be 21 to play. Personal Note: I grew up next door to Long Beach, in Seal Beach, where my parents still live. 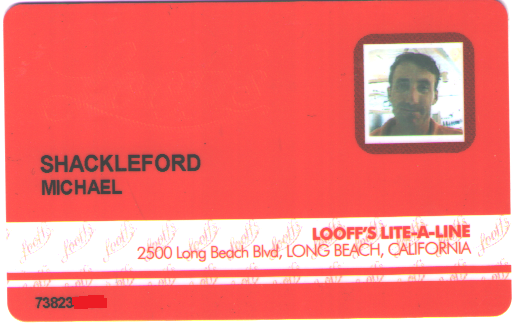 As mentioned above, Looff's is near Willow Boulevard in Long Beach, though the road's name changes to Katella Avenue once you cross the Orange County Line in Los Alamitos. I crossed Katella every day on my way to junior high and high school, and I used to work at the Rossmoor Car Wash on the corner of Katella and Los Alamitos Boulevard. Although I lived not far from Looff's for much of my life, I never heard about it until 2013. Vending machines off to the side is pretty much it when it comes to the food and beverage department at Looff's. I hear they sometimes serve hot dogs or pizza when a big game is on, and they do have a wide screen television to watch. One of my favorite things about Looff's is they are 100% non-smoking! The odds are easy to calculate. Assuming all players are equally skilled, the expected win per game is the prize divided by the number of players. Most games pay $15 to the winner. For example, when I was there the number of players ranged from 20 to 25. Assuming 20 players, the expected win per game would be $15/20 = 75 cents. At $1 per game, the house edge would be 25% in this example. As mentioned, there is a $2 bonus prize for winning with exactly five marks on the card. I estimate the odds of winning in this way to be 1 in 5,313, assuming the player won in the first place. The bonus, therefore, lowers the house edge by about 0.04%. I visited Looff's at about 1:00 on a sunny afternoon in September. When I walked in, I probably looked bewildered as I had little idea of what to expect. All I knew was the game was some hybrid of bingo and pinball. A nice lady was quick to ask me if she could help. I said it was my first time and had no idea what to do. She patiently went over the rules and let me play a couple of practice games. During one of the practice games, she made me stop because I was one number away from winning, and since I was just practicing, she didn't want me to steal a win from a paying player. After my practice games, I was excited to play for real and went over to the cashier. The cute gal there explained how everybody gets a player card, featuring a photo of the player. Cash is then converted to credits, which are added electronically to the card. As a new player, I was eligible to receive five games for the price of one. They also had a deal going where if you purchased $40 in credits you got a free t-shirt. Despite having no shortage of t-shirts, I'm a sucker for adding a "free" one to the collection. So, with $45 in credits and a new t-shirt in hand, I was rip, roaring and ready to play! Of the 64 Lite-a-Line units, I chose number 11. When given the choice, I'll always pick a prime number. I placed my card in the reader and waited for the next game. There are no buttons to press or wagers to make; if your card is in the reader, you're in the game. Every time a new game starts, the cost, usually $1, is deducted from the credits and the plunger is activated. I've gambled in hundreds of casinos all over the world, but I've never seen such an effortless way to make a bet. Despite my couple of practice games, I found the plunger still took a little getting used to. At first I went simply on feel. Then I developed a strategy where I pulled the plunger about 1/8" past a visible worn ring on the plunger's rod. However, I noticed that this strategy didn't produce consistent results. I figure that the force of the ball is not just a function of how far back you pull the plunger but also how long the spring has been compressed – the longer you hold it, the less force. Some releases completely fell flat because I didn't let go fast enough, and the handle of the plunger rubbed against my fingertips as it sprang back. It took about two dozen games for me to realize I was over thinking the physics of the game, as evidenced by a high percentage of shots that were too weak or strong for the ball to drop down. At this point, I decided to revert back to my strategy of simply going by feel. My results improved. In the 45 games I played, I should have won just about two of them, based on a total number of players ranging from 20 to 25. In actuality, I won just one game. Assuming an expected number of wins of two, the probability of winning exactly one is 27.1%. Whether I didn't meet expectations was due to bad luck, or a lack of skill, I'll never know. Probably a combination. When I was done, I cashed out the $13 remaining of the $15 I won. Then I walked around the room and admired the memorabilia from the old Long Beach Pike. I also read a piece of paper that announced promotions Looff's was doing in September. Maybe it was just an excuse to talk to the cute cashier, but I asked for a copy of the September promotions. She didn't understand what I was asking for, so she summoned the friendly lady who gave me the two free games. I showed her what I inquiring about, and she told me to wait while she looked for a copy. A few minutes later, an older gentleman came out and asked if he could help me. So I explained what I was looking for. He kindly asked if I was a new player, where I was from, and how did I hear about the place. This led to a long and enjoyable conversation about the history of the place and much of the memorabilia inside it. It turned out I was talking to the manager, Michael Cincola, who was also the son-in-law of Charles Looff. As an expert in classic amusement parks, Cincola was the perfect person to ask a question I've had for decades. I've heard the expression "grab the brass ring" all my life. As I've been told, old carousels had a dispenser of rings, which was barely within reach as riders passed around it. Most rings were made of steel, but the few brass ones entitled the lucky bearer to some kind of prize. However, as the father of three kids and a former kid myself, I've seen plenty of classic carousels, but I've never seen any with a ring dispenser. So, I asked Cincola where are these rings everybody keeps referring to? He explained that back in the day carousels did indeed have these ring dispensers. The problem was that kids would lean over too far to grab them, fall off, and hurt themselves. In this day when injury lawsuits are ubiquitous, who can blame the carousel owners for getting rid of the rings, even at the expense of fun. Not only did Cincola help me resolve this one of the many mysteries swirling around my head, but he gave me a couple of old carousel rings, one brass and one steel, as well as an old game token from before Looff's went to electronic payments. Everyone at Looff's went well beyond the call of duty in terms of customer service. As someone who has lived in Las Vegas the last 12 years, this was a very refreshing change. I think every casino manager in Vegas could take a lesson in how Looff's treats their players. I thoroughly enjoyed my visit to Looff's. With a house edge of about 25%, it wasn't the best bet I ever made on a percentage basis. However, at $1 a game, I view this more as a form of entertainment than gambling. Assuming one game every two minutes, the cost of entertainment would average about $7.50 per hour, depending on the number of competing players. 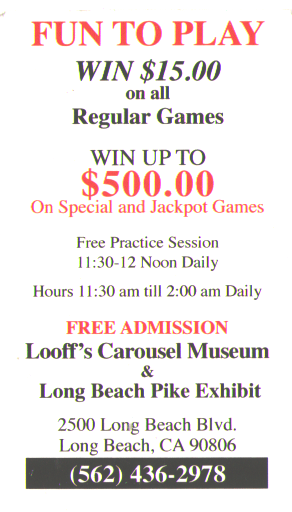 If you live in or near Long Beach and enjoy a good time-killing kind of game, then I would highly recommend Looff's. For anyone visiting the Los Angeles area, Looff's is located a few blocks south of the 405 freeway, off the Long Beach Boulevard exit, on east side of the street. I would certainly play at Looff's over a slot machine any day. YouTube video of me playing. Yes, I know I stink, but it is hard to play and hold the camera at the same time. Hours: 11:30 AM - 12:00 PM practice games, 12:00 PM - 2:00 AM cash games.